Calling all Peanut Butter-Chocolate lovers out there. Today, I have the ULTIMATE dessert for you. Trust me, you will not want to pass this up! These Peanut Butter Truffle Brownies are inspired by my Twix Truffle Brownies and are outrageously delicious! 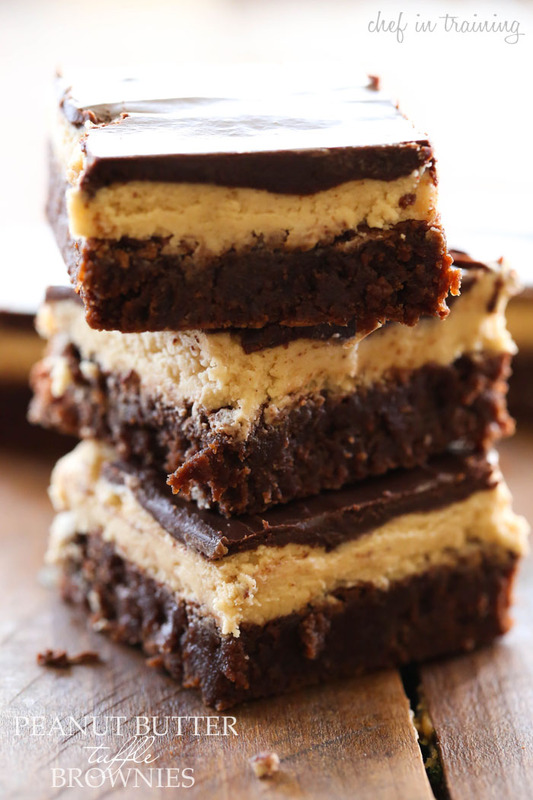 I mean, when you have layers of fudgy brownies, soft peanut butter truffle and rich chocolate ganache, you really can’t go wrong! Each bite is heaven. Trust me. If you love peanut butter and chocolate, these brownies will quickly rise to the top of your list of favorites! These are INCREDIBLE! Layers of fudgy brownie, soft truffle and chocolate ganache combine to make one unforgettable dessert! Add eggs and vanilla and mix until well combined. Add cocoa, flour and salt and stir until well mixed. Pour into a greased 9x13 pan and bake at 350 degrees F for 20-25 minutes or until done and toothpick test comes out clean. In a small bowl, cream butter and peanut butter. Add powered sugar and milk and beat until mixture comes together. Press over cooled brownies. In small microwavable bowl, melt chocolate chips and cream for 1 minute on high. Stir and repeat for 30 seconds increments until melted. Once melted, spread over the peanut butter truffle. These look rich! I might have to make these for my next book club. Yummy! How can you go wrong with PB & really fudgy chocolaty brownies...and that ganache! Oh my :) Pinned! ugh, this looks amazing!!! I loved your twix truffle brownies, so I think I'll love these too!! 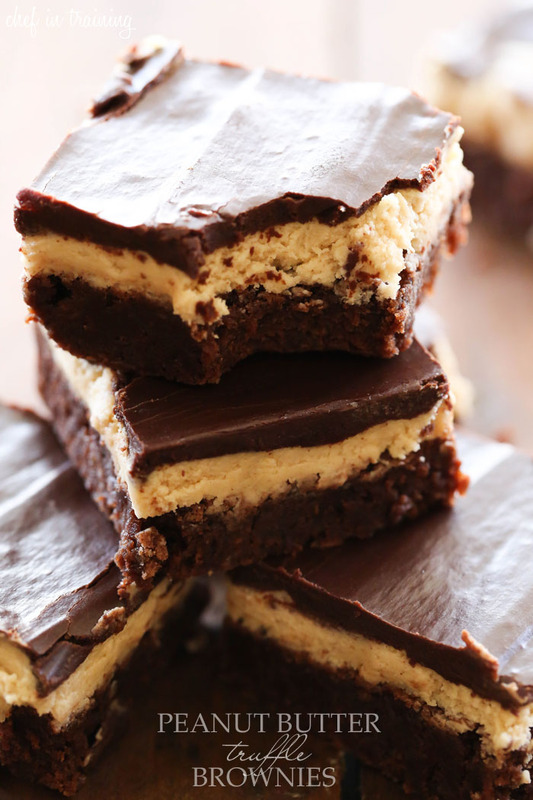 Made these today in a 9x9 pan and the peanut butter layer was so thin! There's no way I could have spread it over a 9x13 pan. They are still delicious, though. I think maybe it needed more than the 1/3 c. peanut butter the recipe calls for? I agree! I made the 9x13 pan an it was sparse to say the least. same goes for the ganache. The picture does not represent well. There is no way to get a moist fudgy brownie with 1- 1/3 cups flour. Mine came out light and fluffy like a cake. All we can taste are eggs! There is a problem with this recipe. A waste of time and ingredients. I also tried to rate this recipe ONE STAR, but it showed up as five stars.